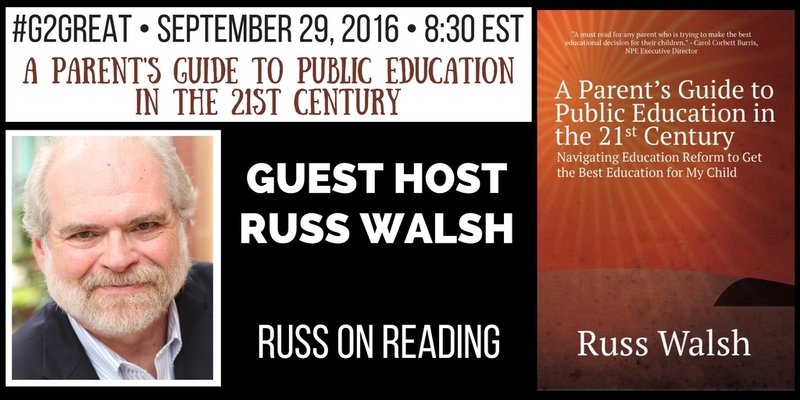 On September 29, 2016, #G2Great was fortunate to welcome guest host Russ Walsh, author of the incredible new book, A Parents Guide to Public Education in the 21st Century. Russ’ knowledge and passion for teaching and learning preceded him, so we weren’t surprised when he quickly enrolled as an honorary member of the #G2Great educational joy club. 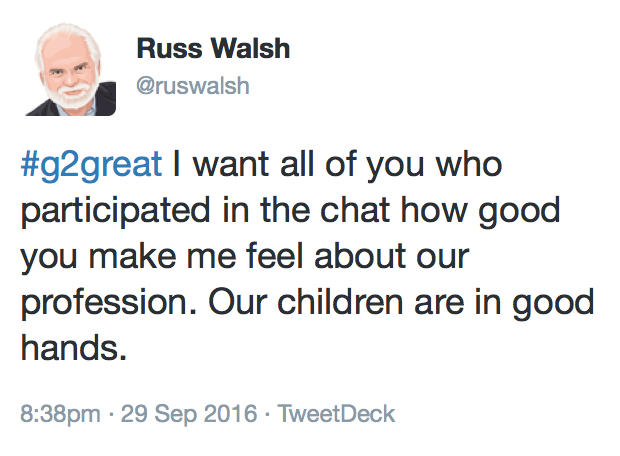 I was a Russ Walsh devotee minutes after happening on his amazing blog, Russ on Reading. Russ lives the words on his front page: Discussing sound literacy instruction, supporting teachers and defending public education. He courageously tackles tough topics sure to elicit ripples of discomfort like 9/19/16; 7/26/16; 3/25/16; 3/9/15; 2/3/14; 9/18/13 to mention a few. My head nods in enthusiastic agreement with every post followed by audible cheers and a healthy dose of Russ gratitude. In his remarkable book, Russ refers to immutable principles for public education in A Bill of Rights for students. After an inspirational walk down twitter memory lane, I realized that our ability to achieve Russ’ Bill of Rights is dependent upon dedicated teachers who bring his words to life in the trenches by transforming beliefs into actions. Our first order of business is to create a warm, nurturing learning environment that is palpable each day our students walk into our rooms. This precursor to learning sets the stage for keeping students at the center of our work. Caring learning spaces demonstrate that we view school as an extension of students’ lives and that we are dedicated to creating a heart home where parents entrust their child into our care each day. As we build this bridge from home to school, we are cognizant that school may well be the only safe haven for some students. This nurturing environment supports our instructional efforts on a day-to-day basis. We welcome the children who walk through our doors and are determined to design experiences that will enrich the learning lives of those children. We know that each child is unique so we create flexible opportunities with specific learners in mind. We view the learning process as a journey and recognize that it is often a messy process of risk taking. We demonstrate in our words and actions that the bumpy road is as important as the final destination and celebrate each step along the way. We know that we can only give children the classrooms they deserve when we see our own professional learning as high priority. We embrace our role as both teacher and learner and seek to understand through the research that will guide us on an exploratory quest leading to success for every child. We reject one-size-fits-all scripts, opting instead for instructional experiences that take the child into account. We trust our growing knowledge of best practices more than publishers because we know that professional decision-making is central to the success of those practices. We know that the high quality flexible instruction we are committed to will only be possible if we truly know students at that specific instructional moment in time. We use our knowledge of students to continuously craft and adjust our learning goals over time. We refuse to define children as a score or number, rather using daily formative assessment to open a window on children as learners. We are resolute in our commitment to communicate in positive ways with parents and use our understandings to support each child’s ongoing pathway to learning. We ensure that there is a variety of instructional settings and experiences in place to create a learning day designed to grow our learners. We know that students need differentiated targeted support so we make room in each day for experiences that will intensify learning. We ground these experiences in authentic purposes, making sure that word work will not overshadow our higher purpose of reading as a meaningful pursuit. We honor each of our readers as we offer inviting books and engaging instructional experiences with comprehension always in our sights. We believe that coordination of efforts is a critical factor in achieving success. We build in regular opportunities for thoughtful dialogue to engage in deeper discussions that explore a thoughtfully responsive way to meet students’ needs. Our collaborations energize us because they are driven by our curiosity about children and our determination to collectively support their success. We know that our strength resides in merging our efforts so we are willing to work side-by-side to that end. We continuously work to achieve instructional excellence together because we know that it can quickly spread across an entire school building. Words like joy, love of reading and motivation came up time and time again during our #G2Great chat. Making time for independent reading and read-aloud in every day with a focus on intrinsic motivation was a common theme. There were countless tweets about reading for the sake of reading with books as the heart and soul of those events. The passion for these joyful experiences was high – and the energy could be felt across the #G2Great Twittersphere. #G2Great is grateful for the honor of spending an hour soaking in Russ’ wisdom and dedication to public education and I am particularly grateful to him for inspiring this blog post. His wonderful new book opens a door from school to home and we happily walked through those doors with our own curiosity about teaching and learning leading the way. We know that our work is never done and that the best way to do it is surrounded by curious others. There is no question in my mind that teachers are and always have been our greatest hope for the future. What we choose to do on a moment-to-moment, day-to-day, and year-to-year basis will always be the difference in our success and ultimately students’. We can say what we believe children deserve but the truth is that until we dig our heels in and do the hard work, those words will remain but an empty promise. In the end, it is only when our actions mirror our beliefs that we can truly demonstrate our deep commitment to children. Thank you for reminding us that dedicated and knowledgeable teachers play the most powerful role of all, Russ! Thank you Russ…. and not bold at all since friend and colleague is the perfect descriptor!